The precision of the Robert C. Byrd Green Bank Telescope in Green Bank, West Virginia, which can be pointed with an accuracy of one arcsecond - equivalent to the width of a single human hair seen six feet away - enabled the astronomers to measure the magnetic field of a single galaxy. A radio telescope that stands taller than the Statue ofLiberty has detected an unexpectedly strong magnetic field as it appeared 6.5billion years ago in a young galaxy. Astronomers have long thought that magnetic fields growvery gradually from slowly rotating galaxies over 5 billion to 10 billion years,but the strong field finding may force some rethinking. Detected in a distantprotogalaxy, it measures at least 10 times greater than the averagemagnetic field in the Milky Way. ?This was a complete surprise,? said Arthur Wolfe, aphysicist at the University of California, San Diego, who headed the team thathailed from several UC campuses. ?The magnetic field we measured is at least anorder of magnitude larger than the average value of the magnetic field detectedin our own galaxy.? Magnetic fields help control the rate of star formationand the dynamics of interstellar gas within galaxies. But until recently,astronomers knew very little about magnetic fields outside our own galaxy. Theyhad previously measured a weaker magnetic field in only one nearby galaxy. However, a different team of Swiss and Americanastronomers previously made indirect measurements suggesting that the magneticfields of young galaxies were as strong backin the early universe as they are in mature galaxies today. 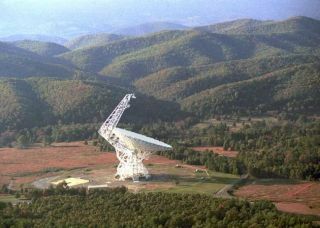 The team behind the new study, detailed in the Oct. 2issue of the journal Nature, used the world?s largest fully steerableradio telescope for their measurements — the Robert C. Byrd Green BankTelescope in Green Bank, W. Va., operated by the National Science Foundation?sNational Radio Astronomy Observatory. The finding represents the first directmeasurement of an early galaxy's magnetic field. The young protogalaxy they probed, DLA-3C286, is locatedin a region of the northern sky that is directly overhead during the spring inthe northern hemisphere. Wolfe said the earlier indirect measurements and his team?slatest direct measurement of a distant galaxy?s magnetic field do notnecessarily cast doubt on the current leading theory of magnetic fieldcreation. That mean-field-dynamo model predicts that magnetic field strengthsstarted out much weaker than they are today. "Our results present a challenge to the dynamomodel, but they do not rule it out," he added. "Rather the strongfield that we detect is in gas with little, if no, star formation, and aninteresting implication is that the presence of the magnetic fields is animportant reason why starformation is very weak in these types of protogalaxies." Wolfe said his team has two other plausible explanationsfor what they observed. "We speculate that either we are seeing a fieldtoward the central regions of a massive galaxy, since magnetic fields are knownto be larger towards the centers of nearby galaxies," Wolfe said. "Itis also possible that the field we detect has been amplified by a shock wavegenerated by the collision between two galaxies." Astronomers hope to extend their magnetic fieldobservations further to better understand their influence on the evolutionof galaxies. "The challenge now is to perform observations likethese on galaxies throughout the universe," said J. Xavier Prochaska,another team member and a UC Santa Cruz astronomer.